Kathryn Rogers grew up in the Bay Area and graduated in May 2018 with a bachelor of science in Wildlife Ecology and Conservation from the University of Nevada, Reno. During her undergraduate studies, Kathryn had the privilege of studying abroad twice: in Australia and Costa Rica. During her time in Costa Rica, she interned at a wildlife center where she helped lead educational hikes and worked with native insects. These experiences sparked her passion for travel and furthered her interest in wildlife and the great diversity of the world. Kathryn attended Loop Abroad’s college Veterinary Service in Thailand during the summer of 2015. This program changed her life and continued to fuel her passion for meeting new people helping animals, and learning as much as possible about wildlife. 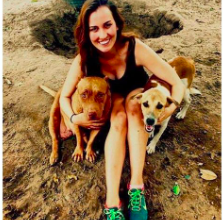 After graduation, Kathryn moved to Danang, Vietnam to work at a non-profit where she spent her time educating local children/young adults about animal welfare and environmental issues and helped to rehabilitate the dogs and cats at the center. It was extremely rewarding for her to see the improvement of the animals and to see firsthand how education can change the plight of animals for the better. In her free time, Kathryn loves hiking, attempting to play beach volleyball, laughing with friends and finding any excuse to try new and yummy foods.